I felt that there is some truth in the observations here, but he missed some key data. What he missed was that by the time most Enterprise IT managers get hold of an idea (who are the fount of all IT wisdom and knowledge according to the consultants) the engineers are mostly bored by it. They’ve already gotten into it and started using it. 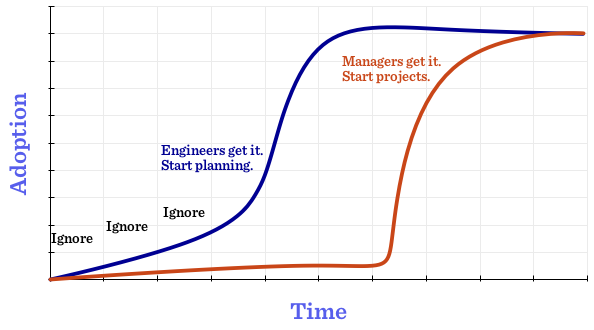 This is where Managers usually start accusing engineers of “not understanding business” or “using process”. Case in point : VMware. Was being used by engineers and developers long before execs finally latched onto the value of it. 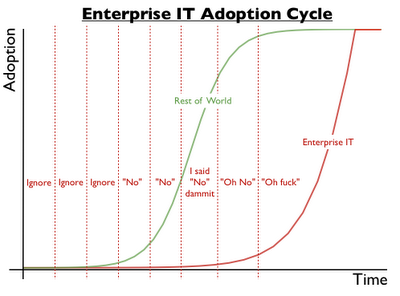 So I developed this handy chart to fix the adoption curve with the correct plot points. Don’t thank me. It was obvious. Of course. Good point. It happened to me so many times. But usually when I implement something new, right towards the end of the project, some manager “takes over” and makes it his flag project. I don’t mind, as long as I am not the one building their power point presentations.